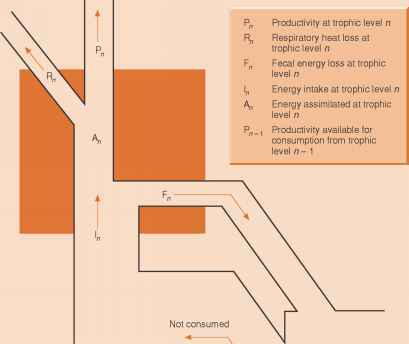 Figure 17.21 The pattern of energy flow through a trophic compartment. Figure 17.22 are the possible routes that a joule of energy, fixed in net primary production, can take as it is dissipated on its path through the community. A joule of energy may be consumed and assimilated by a herbivore that uses part of it to do work and loses it as respiratory heat. Or it might be consumed by a herbivore and later assimilated by a carnivore that dies and enters the dead organic matter compartment. Here, what remains of the joule may be assimilated by a fungal hypha and consumed by a soil mite, which uses it to do work, dissipating a further part of the joule as heat. 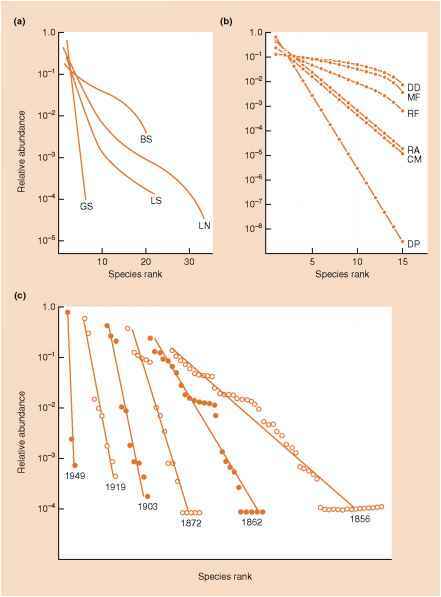 At each consumption step, what remains of the joule may fail to be assimilated and may pass in the feces to be dead organic matter, or it may be assimilated and respired, or assimilated and incorporated into the growth of body tissue (or the production of offspring - as in the case of broods of the bird in Figure 17.20d). The body may die and what remains of the joule enter the dead organic matter compartment, or it may be captured alive by a consumer in the next trophic level where it meets a further set of possible branching pathways. Ultimately, each joule will have found its way out of the community, dissipated as respiratory heat at one or more of the transitions in its path along the food chain. Whereas a molecule or ion may cycle endlessly through the food chains of a community, energy passes through just once. The possible pathways in the grazer and decomposer systems are the same, with one critical exception - feces and dead bodies are lost to the grazer system (and enter the decomposer system), but feces and dead bodies from the decomposer system are simply sent back to the dead organic matter compartment at its base. This has a fundamental significance. The energy available as dead organic matter may finally be completely metabolized -and all the energy lost as respiratory heat - even if this requires several circuits through the decomposer system. The exceptions to this are situations where: (i) matter is exported out of the local environment to be metabolized elsewhere, for example detritus washed out of a stream; and (ii) local abiotic conditions are very unfavorable to decomposition processes, leaving pockets of incompletely metabolized high-energy matter, otherwise known as oil, coal and peat. What are the pathway for energy flow?